Our connections and reputation online are amplified by those who engage with us and carry the words we share. On Twitter, that takes the form of a mention. A mention can be a citation, the source of a quote or piece of content inspiring many. A mention can be a signal of dialogue or even debate. No matter its intention, the mention is important to Twitter because it’s designed to connect people. Whether those connections are good or bad, being mentioned frequently is a sign that a person is an active part of creating industry discussion today. Those mentioned most are the people you’ll find at the center of conversations between leading digital marketers. Leadtail and DNN Software surveyed 504 North American marketing professionals at companies with 50 – 5,000 employees and compiled a number of lists of the people, brands, and publishers they follow and retweet the most in this report. 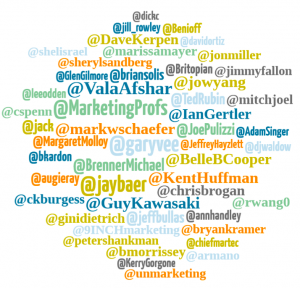 Below are their top 50 most mentioned people on Twitter by mid-size marketers. While most are marketing executives, analysts, writers, strategists and CEO’s, there are a few wildcards like Jimmy Fallon and David Ortiz. Clearly many mid-sized marketers are Boston Red Sox fans. *Based on unique # of mid-market marketers in the sample that mentioned the person.